Here's a depth chart to help you catch all trophies found in Dinosaur Island area, especially the rare ones. To increase the chances of getting rare sea creatures, upgrade your "Lines" and "Weights". 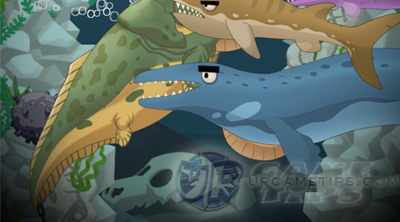 For this island, the hardest creature to catch is the Basilosaurus, because you might need some luck to capture it. You can't grab it's long body or tail with your hook (descending or ascending), it will only work on it's head!